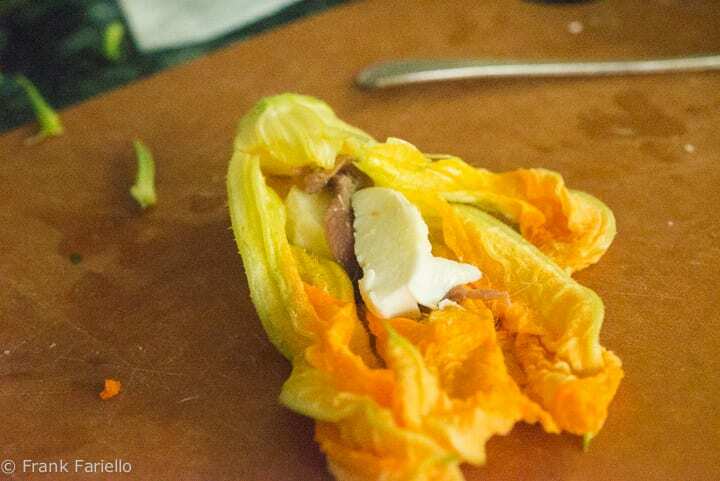 Zucchini is everywhere in our markets in the summer, but zucchini blossoms are another story. They are awfully hard to find. Forget about supermarkets, a better bet is your local farmers market—and even then you may need some luck. So your best bet is to grow your own zucchini, and then you’ll have an endless supply. You see, the flowers are very delicate and start wilting almost as soon as they’re picked. That makes them impractical for mass marketing, but they are well worth seeking out. Their flavor is really unique. Someone once described them as ‘zucchini perfume’, which gives you an idea—but you really just need to experience them yourself. 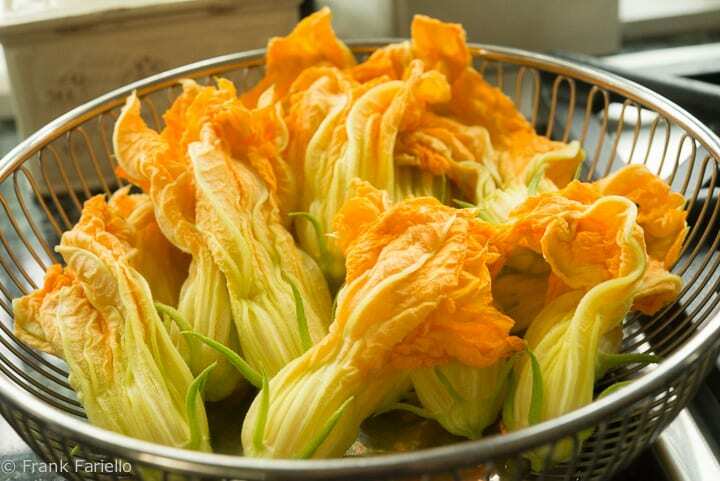 Zucchini blossoms can be used in a number of ways, but deep frying is probably the most popular in Italy and, if you ask me, the most delicious. More often than not, they are dipped in a simple flour and water batter like the one we’ve seen for other vegetable fritters, but Angelina would make them in her usual fashion, dredged in flour and dipped in egg flavored with grated cheese and other good things. She fried them plain, but I love to stuff them with mozzarella and anchovies—a classic combination. Take a strip of mozzarella and stuff it into the flower, then an anchovy fillet, then another strip of mozzarella. (Do not overstuff!) Then close the flower up, pressing the petals together gently with your hands around the stuffing. Now, in a large skillet, heat enough olive oil to come up 2cm/half inch up the sides. While the oil is heating, arrange the stuffed blossoms beside two trays, one with some flour for dredging and the other with the egg batter ingredients, which you will have beaten together lightly. Proceed as you would with any fried vegetables: Taking each blossom in hand gingerly and, making sure with your fingers that they stay closed, dredge them in the flour and then in the egg batter. 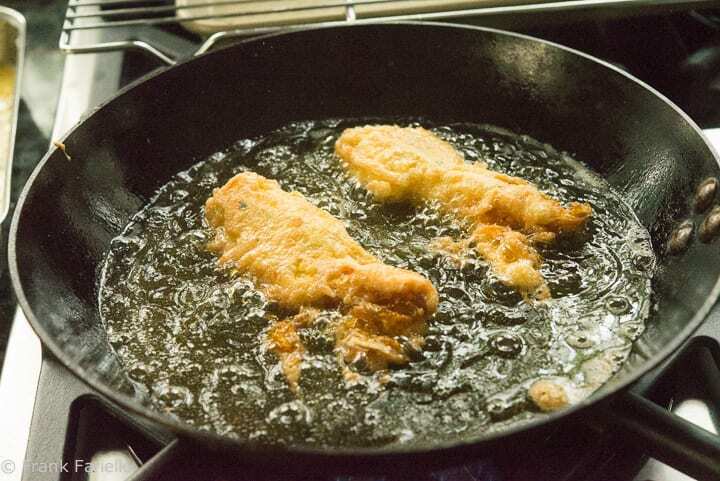 As soon as each blossom is battered, slide it careful into the skillet. Shallow-fry the zucchini blossom in the olive oil until lightly brown on each side. Drain them on paper towels or on a baking rack as they are done. 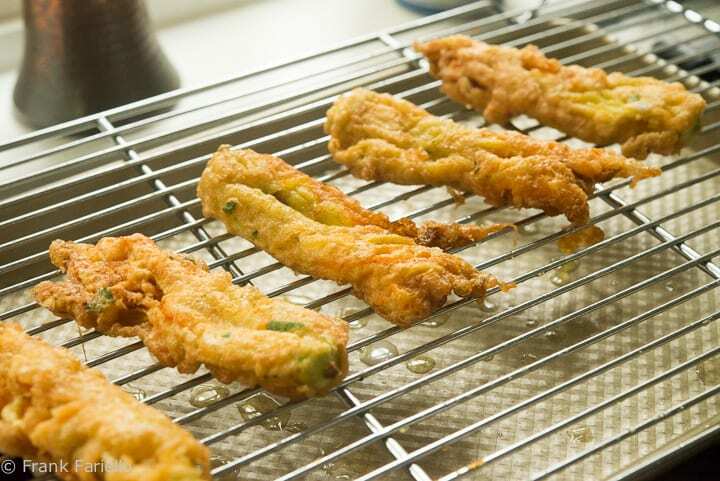 Serve as soon as all the fried zucchini blossoms are done, while they are still warm. 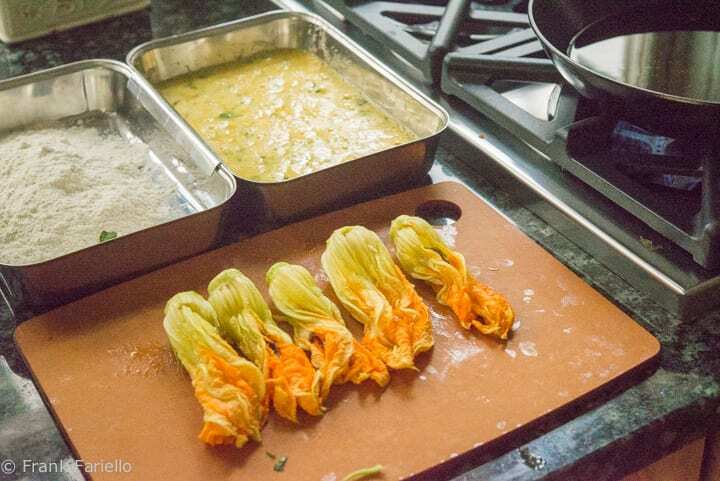 Fried zucchini blossoms can be eaten on their own as an antipasto or as a delicious snack, as part of a fritto misto, or with other fried vegetables as a vegetable-based main course. If you’re lucky enough to find zucchini blossoms on sale, they may be a bit wilted. No worries—they will still be delicious. But they will need some extra care. As they wilt, the delicate petals tend to stick together, making it fussy work to open the blossom for stuffing. Just be patient, all will be well in the end. You may have to resort to slitting open the petal, which is fine—just be sure to close them up well, hold them closed with your fingers as you dredge them and dip them in the batter, and keep them closed until they hit the oil. While I would venture that mozzarella and anchovy is the most common stuffing, as with other stuffed vegetables, there are variations: ricotta and ham, ricotta and mozzarella, capers instead of or in addition to the anchovies, mortadella and fontina, tuna mousse… the possibilities are endless, but the inclusion of some sort of soft cheese that melts and binds the stuffing together seems to be a constant. And, of course, it is possible to enjoy fried zucchini blossoms without any stuffing at all, the way Angelina used to make them—a practical solution for blossoms that are too wilted to open. They are very tasty on their own. Serve as soon as all the fritters are done, while they are still warm. Well I tried em. Not a fan. Too much anchovy per blossom for my taste, and the egg batter over the flour just tasted like omelette. I shall continue to fry them plainly in four and water batter. I’m glad I made them, though! I have grown my own courgettes this year, especially for this reason. I must get about 6 to 8 flowers a day (I use both male and female with gay abandon!) and make a pastela. Fry in olive oil, sprinkle with salt and enjoy with a glass of chilled, dry white wine. My husband and I share this antipasto every day and never get tired of it. I’m definitely going to stuff them soon! The flowers are half the reason to grown them, I think. It’s so hard to find the blossoms here, at least, and the taste really is exqusite. Love these little babies. Sometimes I think I grow zucchini for the flowers…. have not been lucky with frying them. I must overstuff or not use enough oil. But I persevere! Mozzarella + anchovy = classic. Absolutely worth persevering, Claudia! The trick is, as you say, not to overstuff. It’s a natural tendency but you’d be surprised how much taste you can get out of just a bit of mozzarella and anchovy. Thanks so much for your readership, German! So glad you’re enjoying—and cooking!—from the site. And you don’t have to sell me on Mexican cuisine, I already know and love it. Unfortunately, there are very few authentic Mexican restaurants where I live, but when I ever I go to Mexico, the food is a real treat. Looks delicious! In the end everytime I have zucchini flowers I end up doing something other than frying, I should keep just a couple for frying next time! Thanks so much for your comment, Catherine! My bisnonna taught me how to make fiori di yucca fritti when I was very young. I still gather them every year from my gardens and prepare them either stuffed or un-stuffed. When stuffed, I like to stuff with anchovies, but also with prosciutto on occasion. Such a summer treat that takes me back to my bisnonna’s cucina! So glad I could bring back those memories, Roz! sono uno sfizio irresistibile Frank ! E come! Grazie per la visita, Chiara! My mother used to clean as you explained, then in a frying pan would mix olive oil and water, same amount at same time, fiori di zucca, let evaporate the water and as soon they start to fry, add the eggs mixed with parmisan or romano cheese and make a frittata. Too good to ferget the aroma…..thank Frank. Sounds wonderful, Vittorio. I’ll have to try your Mom’s frittata real soon! Who wouldn’t love these? Made with love my favorite is with mozzarella and anchovy. They’re sensational. Veramente un piatto piacevole e stuzzicante 🙂 Complimenti, mi hai fatto venire voglia di mangiarli!